Understanding why and how to employ each component of the social success cycle is the key to making sense of what can look like chaos on the social web. As a marketer, it’s hard to know where to start with all the different avenues you can take with social media. The good news is that all major social media channels fall into only two categories — and recognizing these categories is key to effectively harnessing social media channels as part of a comprehensive marketing strategy. Seeker channels are social media platforms that users go to when seeking specific content. Think of these channels as modified search engines like Bing or Google. Users generally go to the channel to search for and discover content, and they consume that content on that channel. The two big players in this category are YouTube and Pinterest. When users visit YouTube, they are generally in “seeker” mode. They use YouTube’s search bar for a specific inquiry and consume the video right on the platform. Similarly, people use the Pinterest search bar to get specific information on topics like recipes, crafts, or fashion. Though it’s image-based, Pinterest also operates like a search engine. These seeker channels are perfect for social influencing. Strategically placing content on these sites provides a way to share valuable information with your target audience and works to build authority and trust with your brand. Seeker channels are also perfect for social selling. You can optimize videos on YouTube or images on Pinterest with calls to action that serve to transform leads into customers — or at the very least, encourage your prospect to consume even more content on your website. 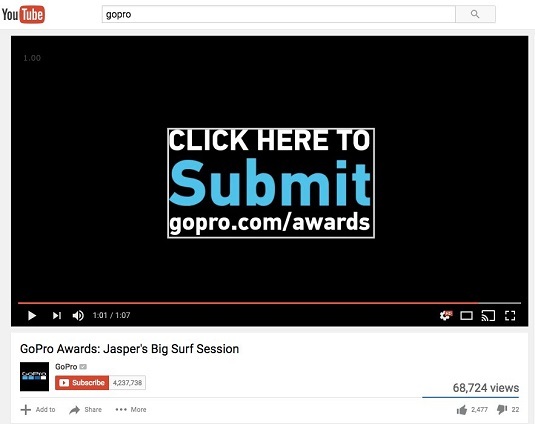 Here is a GoPro YouTube video with a clear call to action at the end of the video to submit images and videos to GoPro. On the opposite side of the coin are engagement channels. On these social media outlets, users primarily engage and connect with others. This is the place where user-to-user conversations are commonplace. Users carry on conversations and share short-form content that links to longer-form content elsewhere. A great engagement channel example is Twitter. Because of Twitter’s 140-character limit, you often see tweets bearing a snippet of information with an accompanying link that takes you off the platform and to another site. Engagement channels are best for social listening, because conversation is paramount. You find conversations going on between brand and customer, customer and customer, customer and prospect. These back-and-forth conversations are perfect places to monitor and respond to your customers and prospects, or even to see how your competitors are communicating. Because conversation is a native experience, engagement channels are also perfect places for social networking. Major engagement channels available on the social web are Twitter, Facebook, and LinkedIn. Not every social media channel falls into these two categories, but most of those with widespread usage do. As a marketer on a seeker channel, your priority is to make sure that users can discover your content when they are performing searches. Engagement channels are all about listening, sharing content, and networking. Be sure to focus on social customer service and how often you engage in active conversations with your customers, prospects, and influencers on engagement channels.